The year is coming to an end and as it is common practice to look back to remember what great games you played in the past 12 months, we, too want to award a prize to the best of them. Of course, our regards go to you, our CryENGINEERS, and so we're looking to honor the best CRYENGINE Indie Game. We have three awesome nominees – and prizes for the winners and those who vote! We had a hard time deciding because the amount of great projects you guys have been putting out this year is simply amazing. To keep it fair and square, we decided to only consider games that have been fully released this year - and didn't count early access games. So without further ado - here are our three nominees for CRYENGINE Indie Game of the Year - 2017: An ancient world, long abandoned. Where has everyone gone? What lies beyond the valley? Immersed in this world of dark beauty, thrilling mystery and ancient structures, you embark on a quest to discover the truth about who you are, and what disaster befell this magnificent ancient world. - and we highly recommend to get the Soundtrack Edition as the music in this game is so enchanting and beautiful - it will keep on giving for a long time after you finished the game. Explore a verdant landscape, vast temples and master ancient technology to reveal the macabre secrets of this haunted, forgotten world. With revolutionary story and puzzle mechanics, Aporia: Beyond The Valley reveals a dark and deadly past and sounds a warning to our possible future. _________________________________________________________________________________________________________________________________________________________________________ Deceit tests your instincts at trust and deception in a multiplayer first-person shooter. You wake up in an asylum to the sound of an unfamiliar voice, surrounded by five others. A third of your group have been infected with a virus, but who will escape? Whilst traversing the building the power will be going out creating darkness, allowing the infected players to transform into their terror form and strike. Find allies and complete objectives around the map to better your chances of survival. Check out the DECEIT Winter Event on Steam - it's FREE to play! _________________________________________________________________________________________________________________________________________________________________________ Something strange appears in the woods. Rain pours, and darkness hangs in the air. _________________________________________________________________________________________________________________________________________________________________________ And that's in it for you, CryENGINEERs! We are proud and honored to see such talented teams develop amazing games with our software. All of you who are here are developers in some capacity; artists, game designers, programmers, contributors and creators. We want to empower you to achieve your vision and keep the indie scene alive and kicking. We couldn’t do this without you, our CryENGNEERs, a faithful community sticking together, providing great feedback for the engine and our service and helping each other out wherever you can. So we want to give something back; not just to the winning nominee, but also to those who vote. We are raffling off some game keys for Aporia: Beyond the Valley, The Land of Pain and Werewolf Pack keys for Deceit! They make great gifts for friends if you already own the games or are the perfect opportunity to try them yourselves if you haven't yet. We will raffle keys in batches each week the voting is up - and announce winners here on the thread and via PM. Vote + leave a comment on this thread and let us know why you voted for the game in question for a chance to win game keys/In-Game items! Season's Greetings and good luck to all of you! 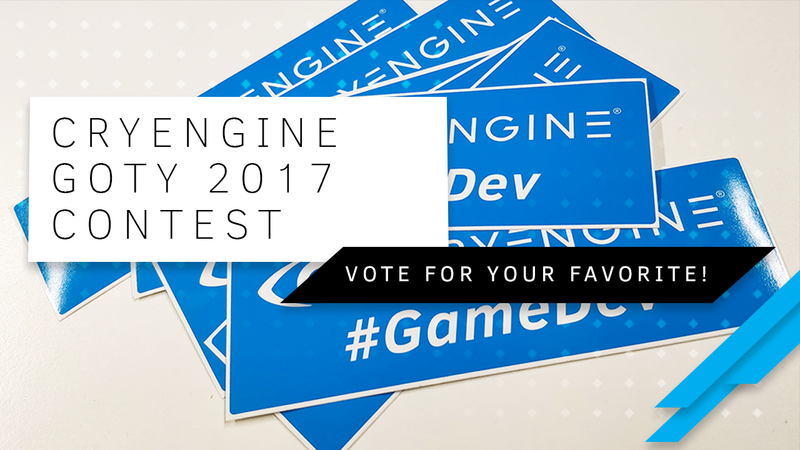 Keep creating amazing games with CRYENGINE, and next year, it might be your game that's up for vote. Re: [WIP] CRYENGINE Indie Game of the Year Award - Cast your Vote! Crytek GmbH („Crytek“), Grüneburgweg, 16-18, 60322 Frankfurt am Main, Germany, is the operator of the CRYENGINE's Best Indie Game of the Year Voters' Raffle („Raffle“) By participating in the Raffle, each participant unconditionally accepts and agrees to comply with and abide by these “Participation Terms”. The Raffle will begin on December 18, 2017 with the announcement of the Raffle on Crytek’s CRYENGINE website and ends on 11:59 PM CEST on January 15th, 2018. And that's in it for you, CryENGINEERs! Are you just trying to convince me that this huge "faithful community" only came up with 3 projects on this engine? Or it's you chose only 3 projects when there's quite a lot to highlight? My vote goes to the land of pain. I really enjoyed the story. My vote goes to Land of Pain as well. Great story and put together entirely by a single developer. Deceit because it´s the first game that was released using CEV and shows an impressing result considering the deleopment length. Also I ´m quite excited about Automatons new IP. We did chose 3 games that released in 2017 that the team deems their favorites for various reasons. That doesn't mean we don't appreciate all the other games and projects released and in the making. But for a faithful voting-process that doesn't get confusing, a pre-selection had to be made. If you feel like there's a project or projects that is/are worth to be highlighted more, just ping me and we'll evaluate it/them and see it done. There are several ways to be highlighted all year round that apply to games of all stages; not just released ones, and the rules for that are in our Showcase Gallery. Everyone with a CRYENGINE project can participate. Wolcen is one of our all-time favorites, but it's still in early access. Only fully released games were considered for this GotY voting. As soon as Wolcen is out, it's going to be in the selection most definitely.